This deep opaque plum colour wine has a fruity bouquet with hints of cassis and plum. It is full on the palate with fine tannins and an excellent balance. 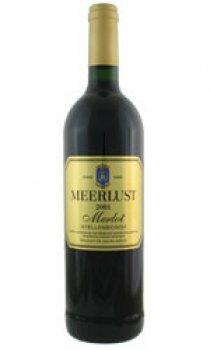 Meerlust Merlot will age very well for up to 12 years. Enjoyable with all fine food. Tasting notes: Very intense, almost purple black in colour, very lively & bright. Typically Merlot on the nose with juicy plum & mulberry fruit, followed by a pronounced spicyness, cloves & liquorice bouquet. The wine is also starting to show secondary characteristics of red earth, chocolate & ink on the nose, as well as a smoked meat complexity. The Merlot is full bodied with mouth filling juicy fruit opulence, creamy richness and very soft, textured tannins. There is a core of richness & structure which will open up as the wine matures. Vinification: Fermentation in open steel tanks for 7 days. After pressing, the wine was settled and underwent malo-lactic fermentation in the tanks. It was then matured in 300 litre Nevers oak casks for 18 months and for 2 years in the bottle before release.